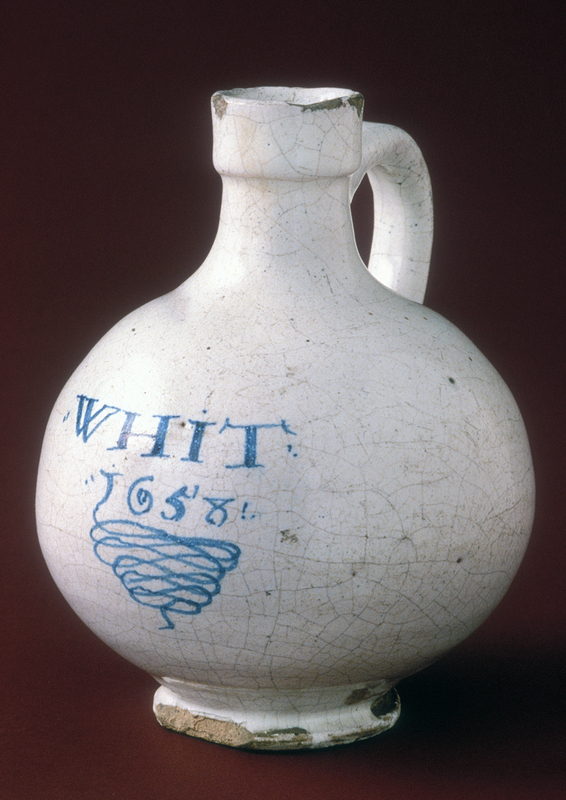 From the 1650s onward, colonists acquired an ever-broadening variety of wines. 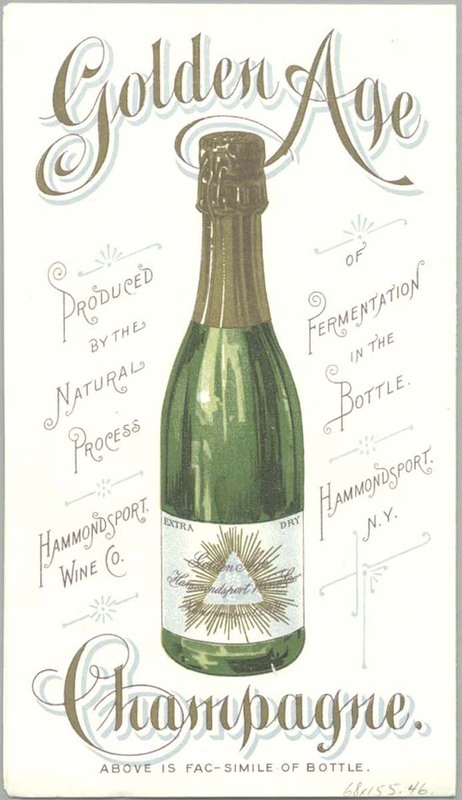 Most fine wines continued to be imported, but large landowners also began to plant domestic vineyards, and alcoholic beverages could even be made at home from recipes in cookbooks. 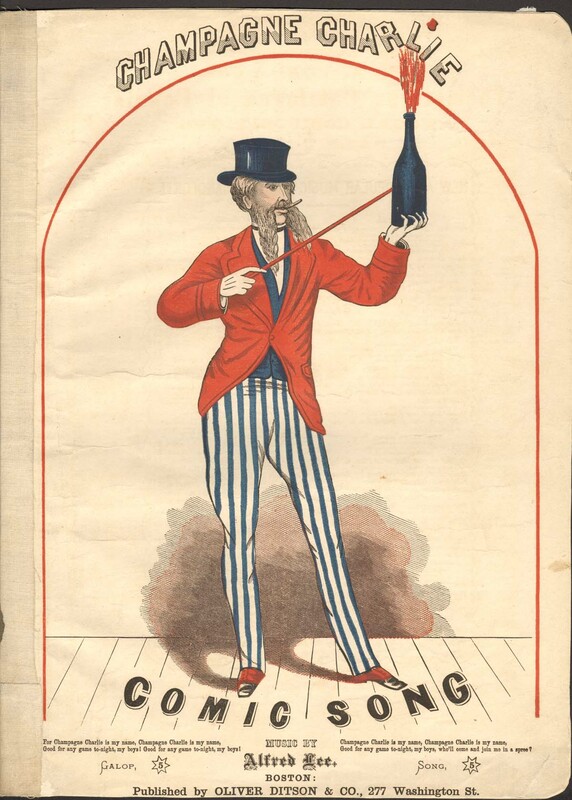 One 1867 Philadelphia publication entitled Six Hundred Receipts, Worth Their Weight in Gold included recipes for 18 types of wine, 26 brandies, 14 “cottage beers,” 7 rums and whiskies, and 6 gins along with others for cider and cordials. the good people of Connecticut when they form the semicircle round the warm hearth, and the Tankard sparkles with Cyder, are as merry and sociable as New Yorkers are when they tipple the mantling [foaming?] Madeira. 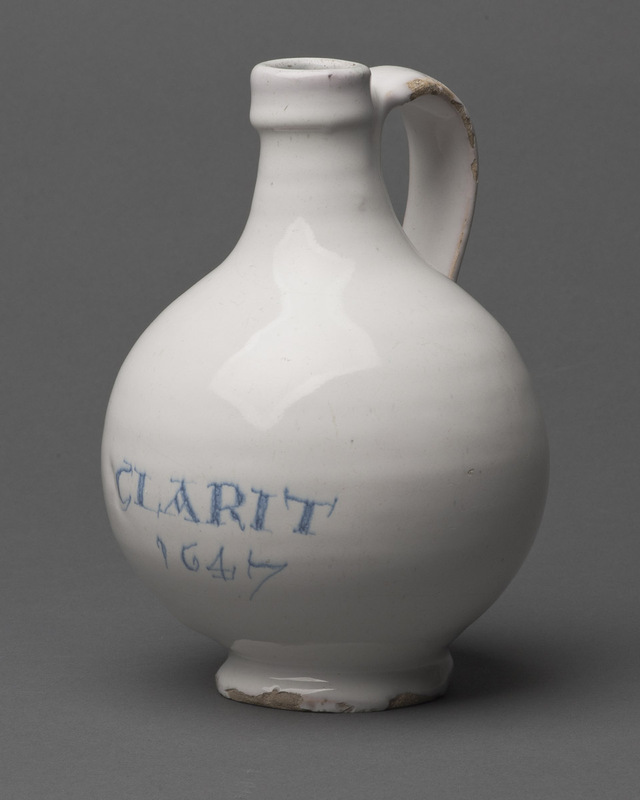 Although bottles and decanters used in Britain and America typically had no inscriptions, some did have the names of wines or spirits engraved or painted in enamel on the vessel. Inscribed hanging labels and stoppers were also available. Ale—A type of beer brewed from malted barley. Cider and perry—Typically fermented from fruit other than grapes—cider from apples; perry from pears. Alcohol content is similar to ales and beers. Cordial—Made from brandies and other distilled spirits. Flavored with berries and herbs; served in small-capacity glasses. Used socially and medicinally. Mead—Fermented from honey. Can be sweet or dry. Recipes often included spices, grain, or fruit. Spirit—Strong beverages containing ethanol. Made by distilling fermented grain, fruit, or vegetables. Common types include whiskey (usequebaugh) distilled from grain; gin from grain or malt and flavored with juniper berries; and rum, from molasses and other sugar-cane products. Brandy is a spirit distilled from wine. Wine—Typically refers to an alcoholic beverage fermented from grapes, other fruit, or flowers. 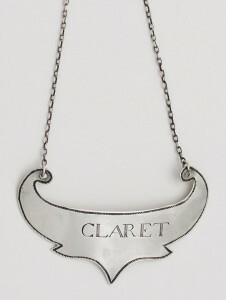 Classed by place of origin, color, sweetness or dryness, and still or sparkling qualities. Commonly divided into table or sweet wines, such as sherry or port, in the 1600s and 1700s. Perhaps the most obvious division of wines is according to colours, as red and white; but another arrangement . 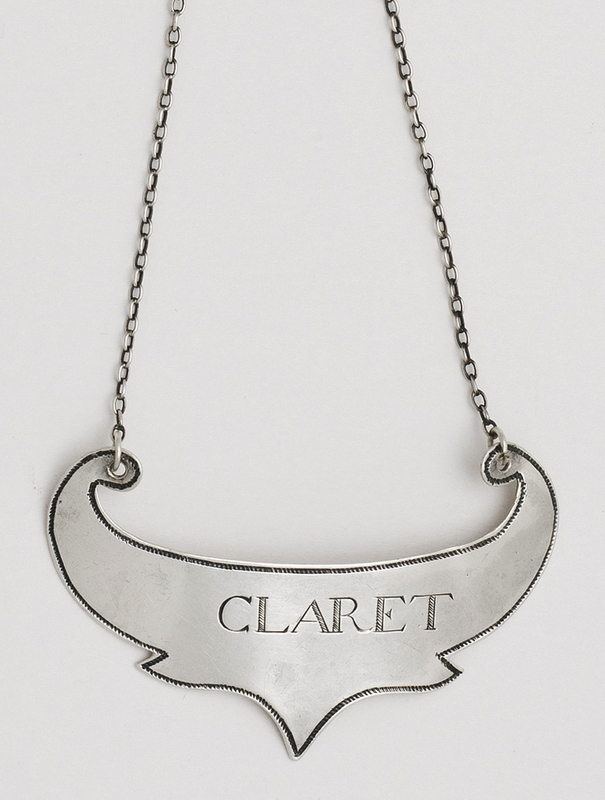 . . considers them as 1, dry and strong, as Port, Sherry, and Madeira; 2, dry and light, as Hermitage, Claret, Burgundy, or Hock; 3, brisk, effervescing, and sparkling, as Champagne; 4, sweet, as Malmsey, &c.
The silver “CLARET” wine label has a history of ownership by John Brown, a Revolutionary War hero, successful merchant, and ship owner in Providence, Rhode Island. Unlike port, which is associated with Portugal, sherry takes its name from Xeres (now Jerez de la Frontera) near Cadiz, Spain, where it was first produced on some scale. The prestigious Walpole Society, of which Henry Francis du Pont was a member, presented this bottle to du Pont when he announced his intention to open Winterthur as a museum. 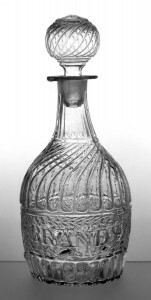 Labels that identify the contents of bottles or decanters are mentioned in period ads and inventories and were often made in metal. 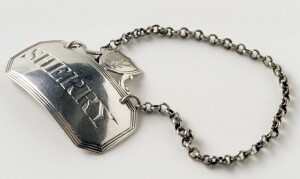 Silver labels might bear the beverage name in engraved or pierced letters; enameled base metal versions might display the drink name in painted or printed lettering. 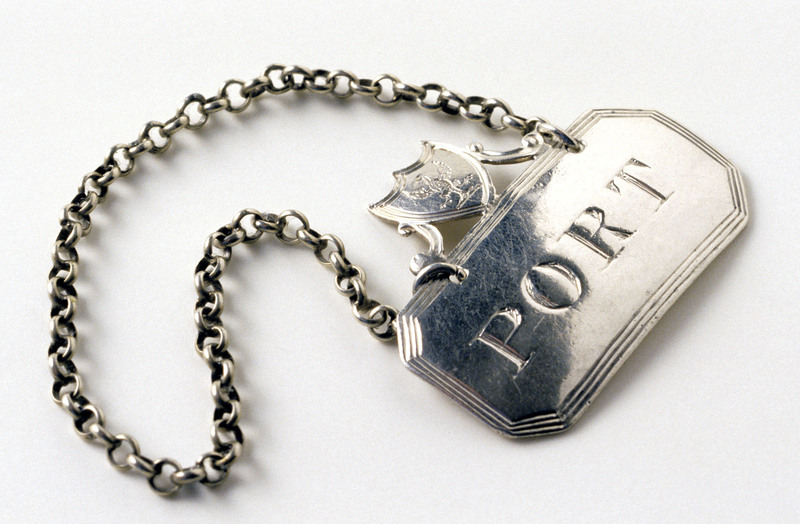 The silver port and sherry labels shown here were made as a set. THE Schooner Francis, Captain Jacob Cooper, will sail from York River, in about three Weeks, for Madeira. Any Gentlemen who want Wine from that Island are desired to send their Letters to the Care of William Stevenson, in York Town, to go by the said Vessel. According to period records, the ship Catharine Banks, whose name appears on a bottle shown here, transported Madeira to America during the early 1800s. 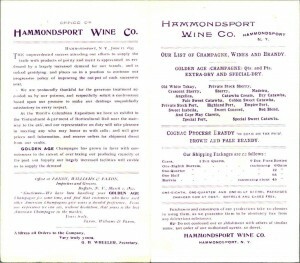 The wine was probably bottled in England before export. The initials “WHF” may refer to William H. Fearing, a member of a New York family of merchants and importers, for whom the wine was rebottled later in the century. 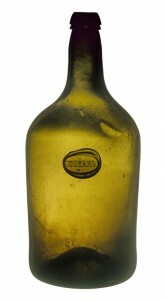 The second bottle also contains Madeira and features a seal bearing the name of the importer as well as a detailed label describing the history of the contents. “Tenerife” or “Teneriffe” is a type of white wine sometimes known as Canary, Palm, or Vidonia and is associated with the Canary Islands off the coast of Africa. Like the “CLARET” label shown above, the “TENERIFFE” label has a history of ownership by John Brown who served with honor during the Revolutionary War hero and was a successful merchant and ship owner in Providence, Rhode Island. As was true of more-costly enameled or engraved decanters, some that were relief-decorated and mold-blown bore beverage names and were available in sets. 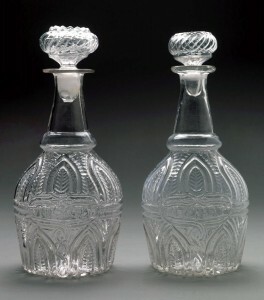 By 1829 inscribed molded decanters were in production at the Boston and Sandwich Glass Company in Massachusetts, the Brooklyn Flint Glass Works, and others. 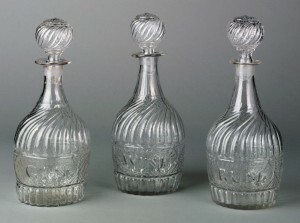 A brandy decanter from this set is shown below. You will be much judged . . . by your Champagne . . . the Americans prefer the sweet and sparkling. [A] dinner or supper is prized and talked of exactly in proportion to the quantity of Champagne given and the noise it makes in uncorking. Special champagne or “ice decanters” include a glass pocket for ice, on the underside, fitted with a cover. Variations with side ice pockets can also be found. 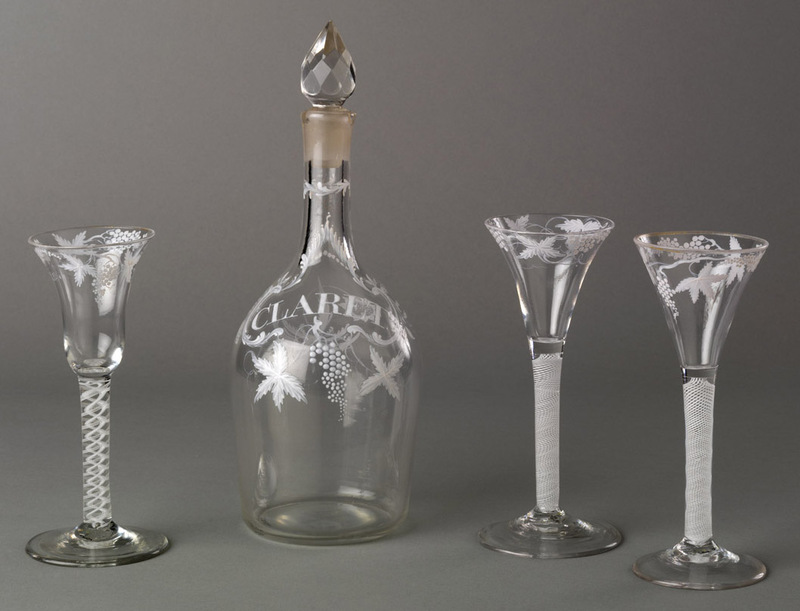 By the early 1800s, Americans were making tall “flute” wineglasses that resembled their foreign counterparts. 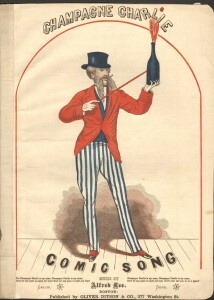 A reduction in import duties during the mid-1800s led to the increased popularity of champagne and other beverages in America. 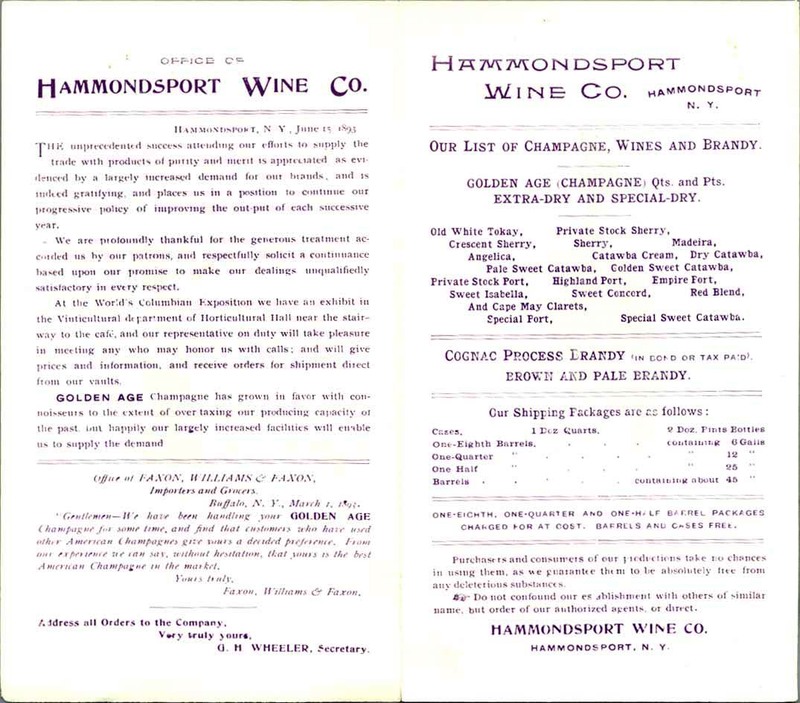 This leaflet lists wines produced by Hammondsport along with their shipping prices and notes with pride that the company is represented in the “Vinticulture department” at the World’s Columbian Exposition—also known as the Chicago World’s Fair of 1893. Vinetum Britannicum: or, A treatise of cider, and other wines and drinks extracted from fruits growing in this kingdom . 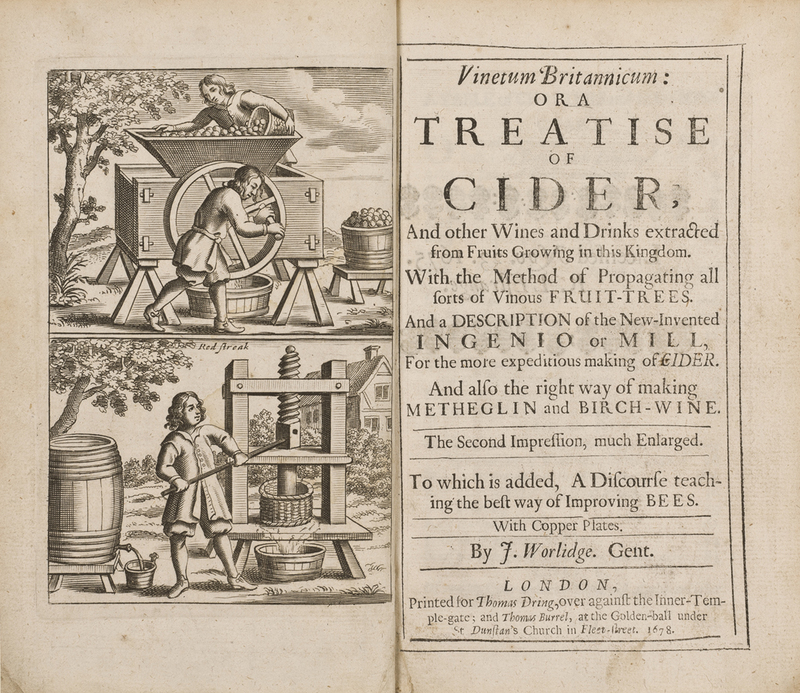 . .
Worlidge’s Vinetum Britanicum focuses primarily on cider, with politically-conscious sections titled “That Cider and other Juices of our English Fruits are the best Drinks for This Country [England]” and “Cider [is] prefer’d to forreign Wine.” He tells how to plant apple trees, harvest the fruit, and then ferment the cider, noting that barrels formerly used for wine are preferable. 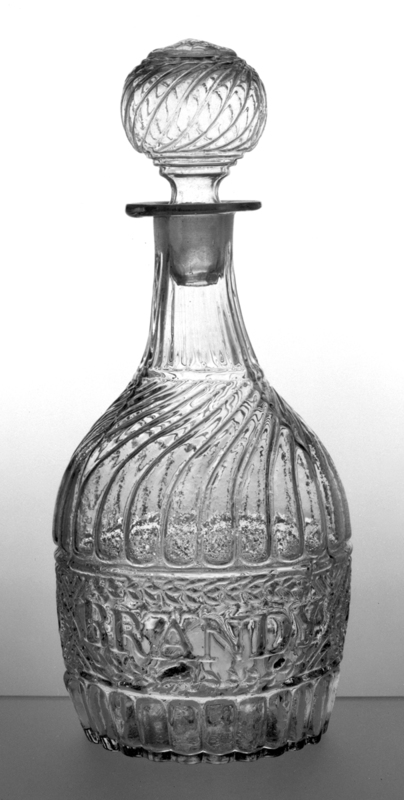 Also included are remarks on fruit wines as well as metheglin (made from honey) and the best vessels for storing alcoholic beverages. 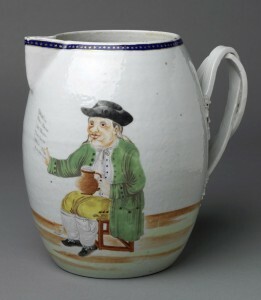 Although the Englishman on this pitcher holds a note referring to his foaming jug of ale, barrel-shape jugs are often associated with cider—a drink fermented from apples. The “DEAR TOM” inscription suggests the vessel was a special commission. 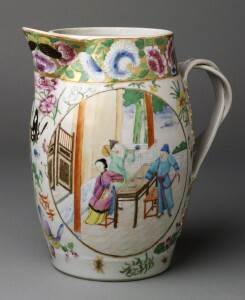 This floral-border pitcher bears fashionable Chinese “mandarin” scenes and, like the previous jug, may have had a low-dome lid. 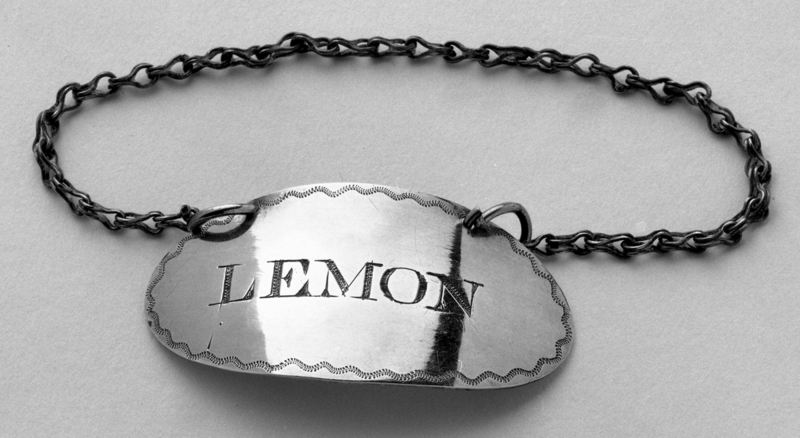 The term lemon, on this rare South Carolina label, may refer to “lemon cordial,” a sweet alcoholic beverage distilled from lemons, initially thought to have medicinal virtues. 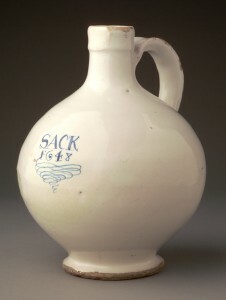 The mark on the label indicates it was made by Nathaniel Vernon, who is thought to have begun his career in New York before moving to Charleston in 1802. 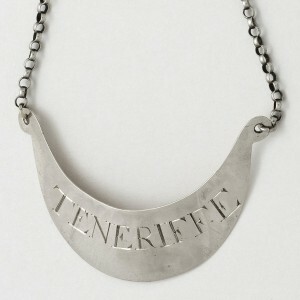 Vernon worked in gold and silver himself and sold a variety of imported metalwork. 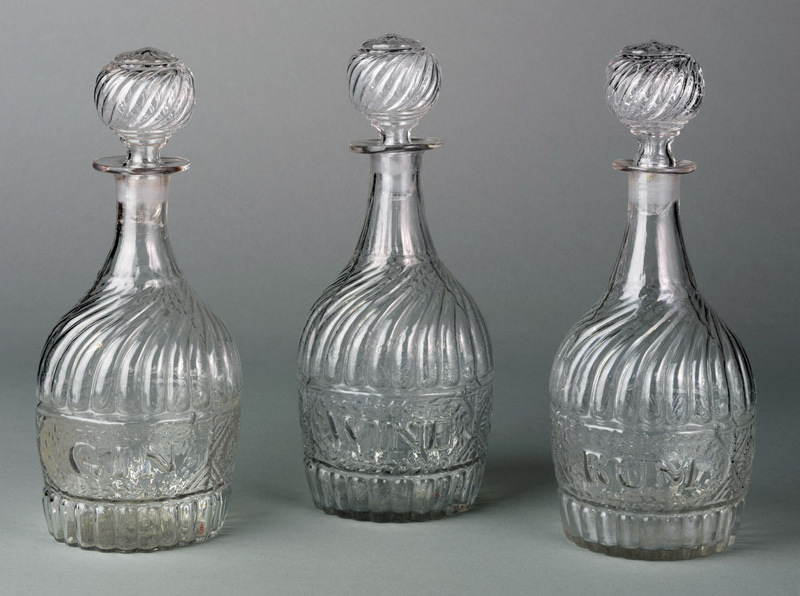 Of the decanters shown here, the one inscribed “CHERRY” is rarer. The name could refer to a cherry-based wine, to fortified “Cherry Brandy,” or to the more punch-like “Cherry Bounce.” Such drinks were imported and made locally. A Scottish parson named Robert Rose, who worked in Virginia, recorded in June 1748 that he “Came up to Capt. Thomson’s, preached and dined, and . . . Drunk a Spirit made of cherries.” Whiskey, or usquebaugh—from the Irish uisce beatha or Scottish uisge beatha meaning “water of life”—was distilled from a fermented mash of grain.